The LEARNING section allows you to sit back and follow along when you choose a technique from several math subjects. A math subject has several techniques while a topic from a subject may have more than one method for doing the same thing. The techniques are shown step by step automatically and do not require any interaction from you interactions by you are needed in other sections. Moreover, the descriptions and computations are also included in the step by step instructions. 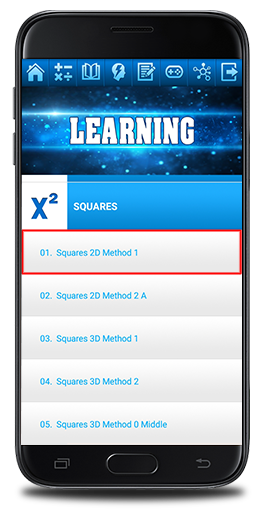 A SQUARES technique is selected from the LEARNING section. This is one of two techniques for squaring two digit numbers. Note that there are several techniques in the eBooks. A DECIMALS technique is selected from the LEARNING section. This particular techniques is for converting fractions with denominators of 5 into decimal numbers. Press the EXAMPLES button to start the lesson which is automatically self driven. Input is not required by you in the LEARNING section. 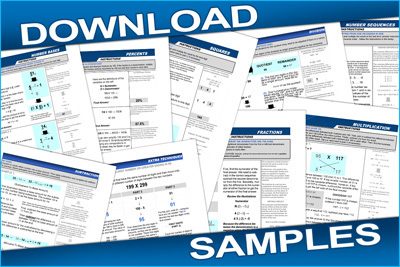 Included in these programs are step by step instructions with descriptions and computations. Read the information in the NOTES for more details. 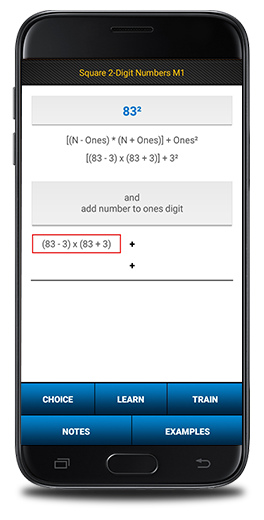 This technique creates two numbers with one number as a base amount, along with a difference squared for squaring any two digit number. 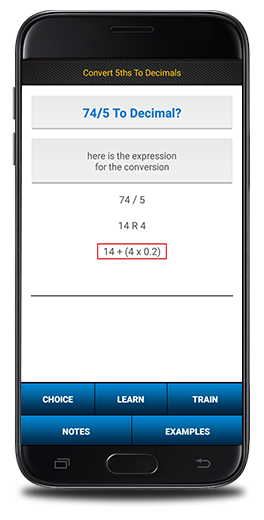 Several techniques are included in the app for converting fractions into decimal numbers. Again, watch and follow along in this section. When the process ends, press the EXAMPLES button to start a new problem.